What is vivisection, you ask? Well, basically, Dr. Moreau was slicing up living animals and combining their parts together in an effort to create humanoid beings. Told from the point of view of the unfortunately shipwrecked Edward Prendick, TIoDM exposes readers to a jarring exploration of the darker side of science, one more associated with medical cruelty and hydrogen bombs than creating a cure for Ebola. Generally, the story is very well written and captivating, replete with colorful descriptions and crisp pacing. Were it not so morbid, it would be a very easy recommendation. As it stands, I would still recommend it, but not for all ages. I think this one is better reserved for at least middle-schoolers and older. 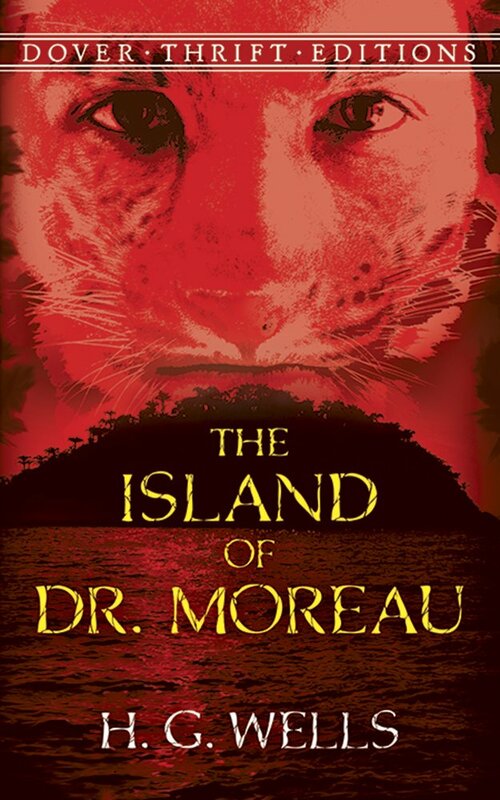 Purchase The Island of Dr. Moreau on Amazon.com. Actually, as I think about it, TIoDM might be laughably tame to today’s readers. With increasingly grotesque horror/splatter films, and with many books providing more severe treatments of the questionable side of humanity, TIoDM might seem almost quaint! Still, I find it to be a tense, paranoid book that sends a shiver down my spine. If it were any grosser, I don’t think I would have finished reading it. As it stands, I would recommend it to a PG-13 audience. Among its positive attributes, I particularly found the book’s pervasive philosophy to be very intriguing. There are many topics under discussion including: is it right to vivisect animals? Can non-human animals become human? Can animals develop souls? These questions might seem academic, as though nothing like this would ever actually happen. But, about 40 years after this book’s publication, Nazi Germany actually brought many of Dr. Moreau’s practices to life in its many concentration camps. The difference is that, in Nazi Germany, the vivisections were often performed on humans as well as on animals. So, The Island of Doctor Moreau actually raises important and real issues regarding the nature of morality and being. Many would regard Dr. Moreau’s and the Nazi’s actions as objectively wrong, yet there are many who deny the reality of objective morals because, in the absence of a standard of morality, there is no right or wrong, no good or evil. In the words of atheist biologist Richard Dawkins, there is nothing but “blind, pitiless indifference.” But, for it to be objectively wrong to vivisect animals (and humans), there must be a transcendent moral standard, as argued by Christian philosopher William Lane Craig. Anyway, these are very deep subjects, and I love that TIoDM actually brings them up. For that reason, despite the grossness, I recommend it to everyone. It is considered a classic, and I would say that moniker is much-deserved. Grant Stevens loves books and movies, and he has written so many Pulitzer-worthy things that is not even funny. He has been published on this site and in the print and online editions of the Christian Chronicle. A good review, Grant, but I think I’ll pass – this just doesn’t sound like my cup of tea! It sounds very disturbing, and I just don’t need that.